There are more than 5,000 species of sponges and they come in all shapes and sizes. Most are asymmetrical (not regularly shaped), though a few form "radially symmetrical" shapes (which means they can be divided into similar halves if cut at any angle along a central axis, like a pie). They are very simple animals with no tissues, organs, or even a brain, but have specialized cells that perform their necessary nutritional, circulatory and reproductive functions. Habitat: They are mostly found attached to the ocean floor in shallow coastal waters, but some species live in freshwater habitats. Habits: They are sessile – they do not move around but spend their lives anchored to one place. Though sponges were once thought to be completely sessile, scientists now know that some species can move very, very slowly. Diet: They are filter feeders, taking in seawater and filtering out the edible matter. Body Traits (Anatomy): Sponges are made up of 2 body layers – an outer layer of epidermal cells and an inner layer of collar cells. The collar cells (choanocytes) trap food particles, while specialized ameboid cells (ameboctes) digest the particles and transport the nutrients to other cells throughout the sponge. Between the two layers is a gelatinous matrix called mesohyl (or mesoglea) where the sponge’s “skeleton” forms. This simple skeleton is made up of tiny spicules that form from either calcium carbonate (calcareous) or silica (siliceous) depending upon the species of sponge. There are also supportive collagen fibers called spongin. 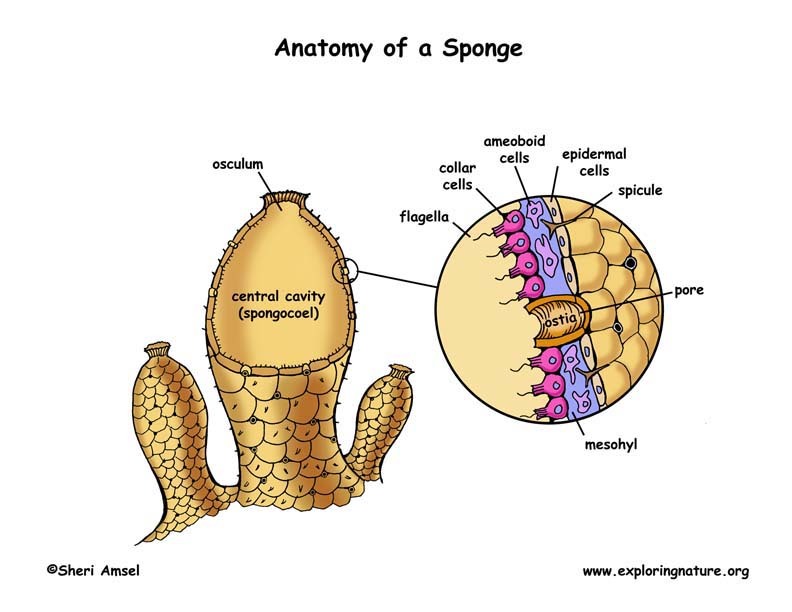 The sponge body is full of holes – thousands of cells, each with a tiny pore (porocytes) that brings seawater in through a small channel, called ostia, into the sponge’s central cavity called the spongocoel. Other specialized cells, called collar cells, line the inside of the central cavity. Collar cells have tiny hair-like flagella that act like propellers and draw the water in where it is filtered to remove all its organic particles. Once filtered, the water is pushed through an opening at the top of the sponge called the osculum. Reproduction: Sponges reproduce by both sexual and asexual means. Sexual reproduction occurs when a sponge releases its male gametes (spermatozoa) into the water and another sponge (or that same sponge) captures them using collar cells and they are transported to the egg for fertilization. The fertilized egg (zygote) develops into a blastula (several cells) with cilia for swimming and is then released into the seawater. This allows the sponge larva to move away from the parent and eventually settle onto the sea floor to mature. Sponges can be male or female (dioecious) or have both male and female sexual organs (monoecious). In extreme cases, when the environment is not good for survival or reproduction, the sponge will produce small gemmules that will survive dormant until conditions are better for survival. 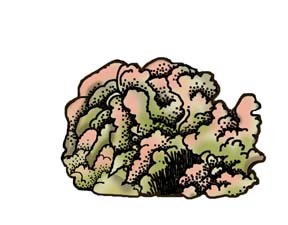 Asexual reproduction occurs through budding where small pieces of the sponge break off and form a new adult. This can result in massive colonies of sponges. This also accounts for the sponge’s amazing regenerative abilities. 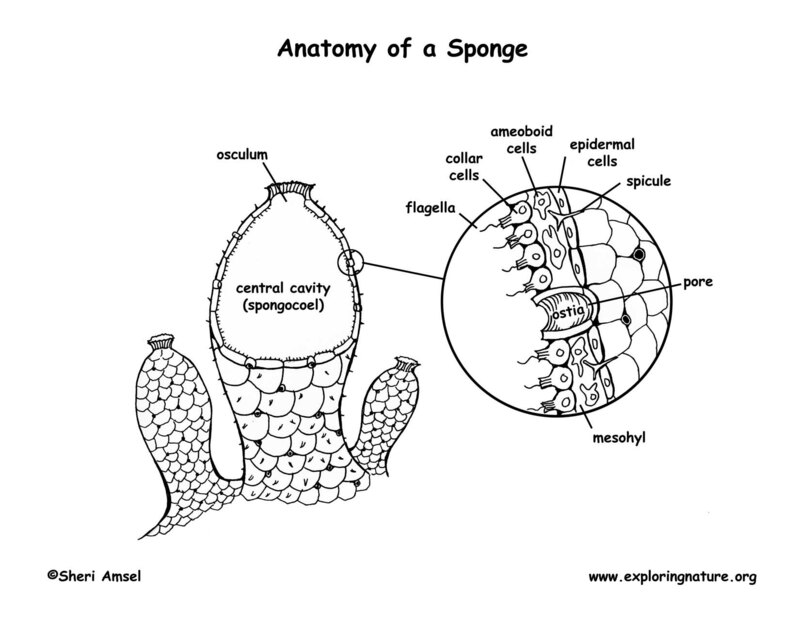 To help students learn the anatomy of the sponge, print out a black and white version of the color diagram below: Anatomy of the Sponge. Assess content comprehension about Porifera (Sponges) with the Mutiple Choice Test. Assess anatomical vocabulary comprehension of the Sponge Anatomy Labeling Page.